Pius IX was the Holy Father of the Catholic Church longer than any other pope, from 1846 to 1878. It was a difficult time to be the leader of the Church because of political conflicts between nations and religious arguments about the Church’s place in the world. No matter what kinds of problems the pope and the Church faced, Pius IX always turned to God for help and direction. Pius IX was born in Italy in 1791. His name was Giovanni Maria Mastai-FerrettiGiovanni Maria Mastai-FerrettiGiovanni Maria Mastai-Ferretti. Giovanni grew up wanting to be a priest, and he followed that goal step by step until he was ordained in 1819. His first assignment was in an orphanage, where he was known for the love he shared with the children. Soon he was sent to South America to work for an important Church official. 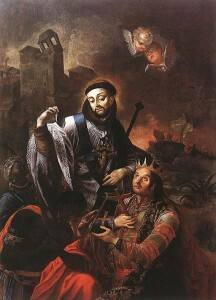 After Father Giovanni returned home, he was made the archbishop of a diocese. When a revolution broke out, Giovanni was the peacemaker. He convinced the two sides to stop fighting. Soon he was assigned to a larger diocese and was named a cardinal. When Pope Gregory XVI died, Cardinal Mastai-Ferretti was elected pope. He chose the name Pius IX. Pope Pius IX is famous for declaring two important Church teachings. First, he proclaimed the teaching of the Immaculate Conception in his Apostolic Constitution, Ineffabilis Deus, on December 8, 1854. Our belief in the Immaculate Conception is that the Blessed Mother Mary was free from all sin, including Original Sin, from the first moment of life when she was conceived in her mother’s womb and remained without sin her entire life. Pius IX made this teaching official after consulting with the bishops of the Church and spending many hours in prayerful reflection. The First Vatican Council was called together by Pius IX. This gathering of all the bishops of the Church and the pope is called an ecumenical council. A pope calls for an ecumenical council so that Church leaders can work together, under the guidance of the Holy Spirit, to explain the faith or better explain Church teachings. 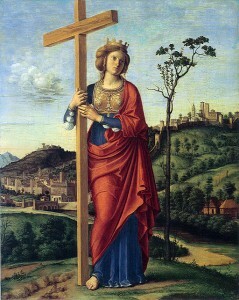 At the First Vatican Council, Pope Pius and the bishops declared the teaching of infallibility. This means that when the pope and bishops teach together on our faith and morality, or way of living, they always teach the truth. Infallibility is a gift of the Holy Spirit, given to the Church to ensure that the teachings of the Church will always remain true and protected from errors. 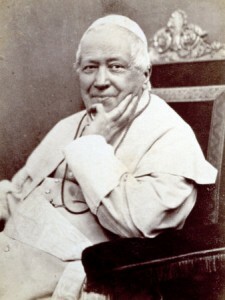 Pius IX, who died in 1878, was the first pope to be photographed. He was beatified in 2000 by Pope John Paul II. As our leader, he helped us grow in our understanding of what Catholics believe. We can pray to Blessed Pius, asking him to help us follow in the footsteps of Jesus by living all the teachings of our Church.